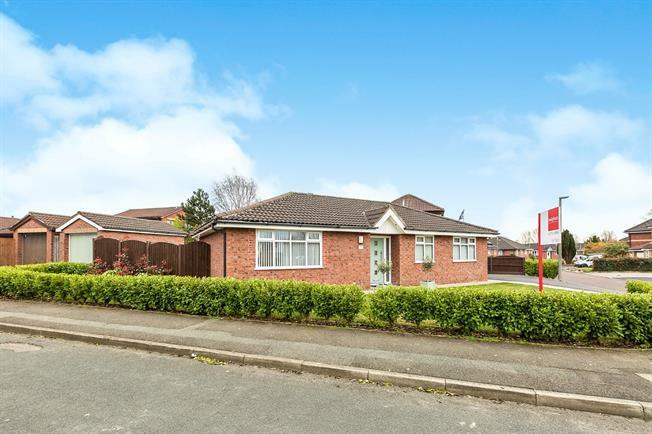 2 Bedroom Detached Bungalow For Sale in Preston for Asking Price £274,950. Good sized hallway with doors leading off, storage cupboard, two ceiling light points, and composite door to the front. Flexible room currently being used as a front lounge, but would be an ideal third double bedroom if required, double glazed window to the front, radiator, TV point and ceiling light point. Newly fitted white gloss walls and base units with integrated fridge freezer, integrated dishwasher, fitted double oven of which the top oven is a combo/microwave, ceramic hob with feature extractor hood over, sink and drainer unit, black work tops, plinth lighting, two ceiling light points, upright white modern radiator, wall TV point, high gloss ceramic flooring and open plan to the Orangery. Stunning Orangery with glass elevations, extra width patio doors opening onto the garden, glass self cleaning pitched roof, radiator, high gloss ceramic tiled flooring and under floor heating. Large master bedroom with two double glazed windows to the front, radiator, Be-Spoke hand crafted four door mirrored wardrobe, TV point and ceiling light point. Double glazed window to the rear, radiator, ceiling light point and door to the utility/storage cupboard. Currently used as a washing and drying utility cupboard. Beautiful newly fitted four piece suite comprising of low level WC, wash hand basin, designed bath with mixer tap, separate cubicle housing rain head shower and hair attachment, stunning mosaic mirror and glass wall tiles, tiled flooring, radiator, chrome heated towel rail, double glazed opaque window, and ceiling lights. To the front of the property is a lawned garden and driveway for several vehicles or motorhome, pathway leads to the front entrance, enclosed with planted borders, motion sensor lighting and lawn leads to the side of the property. To the side of the property is a second driveway leading to a garage and gated access to the rear garden. To the rear of the property is a south facing not directly overlooked garden, York stone laid pathways and patio areas, raised Astroturf area, motion sensor lighting, outside electric plug sockets, outside water tap and remote control flower border lighting, remote control barrel water feature, fence enclosed, gated access to the rear driveway and well established plants to compliment. The rear garden is a tranquil place to relax after a long day. Single brick built garage with pitched tiled roof, power, lighting, up and over main door, door to the rear leading into the garden.